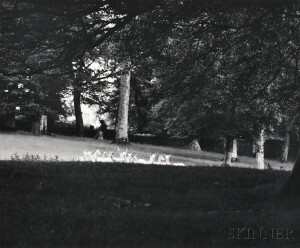 “A New Sort of Poetry:” Wright Morris and 20th Century Photography | Skinner Inc.
We are delighted to offer in our May 13th Fine Prints & Photographs auction a view of a Farmhouse in Winter, near Lincoln, Nebraska (1940, printed later) by the novelist and photographer Wright Morris (Lot 99, $1,200-1,800). In the late 1930s and 1940s, Morris made beautiful and poignant photographs exploring the rural culture of the American countryside. His emphasis was on architecture and still life, but unlike the work of Walker Evans, which provides a more formal description of American vernacular structures such as a view of graffiti on the side of a building in lower Manhattan (Lot 111, $1,500-2,500), Morris photographed farms and homesteads that were fading into the past. Although they are mostly without human subjects, his images offer evidence of bad luck, failure, misplaced faith, tenacity, and human fallibility. As he wrote after a cross-country journey in 1938, “I saw the American landscape crowded with ruins I wanted to salvage” (quoted in Sandra S. Phillips and John Szarkowski, Wright Morris: Origin of a Species, San Francisco Museum of Art, 1992, p. 27). Morris served his literary and visual interests by combining photographs and text. He felt that the two forms could be used in close conjunction without compromising each other to create “a new amalgamated form that could produce a new sort of poetry, and therefore express a new kind of meaning” (Phillips and Szarkowski, p. 10). He combined compressed passages of prose, which he came to see as related in spirit to the photographs he began taking with increasing seriousness in the late 1930s. In 1942 and 1947 he was awarded two Guggenheim Fellowships that helped fund his trips back to his home state of Nebraska, which served as the inspiration for his first two photo-texts: The Inhabitants, published in 1946, and The Home Place (1948). Working with a 4×5 view camera, Morris focused on scenes nearly always devoid of people—the evidence of human presence being the true subject of his images. Many of his photographs provide an evocative balance between realistic description and abstract form. 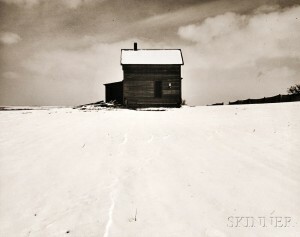 This is true of Farmhouse in Winter in which the seemingly abandoned structure is comprised of rectangular, black and white shapes that stand out against the expanse of untouched snow in the foreground and the wintry sky behind it. Additional works by 20th century masters that shouldn’t be missed include a large print of Paul Caponigro’s Standing White Deer, Ireland from 1967 (Lot 113, $2,000-3,000); La Mama del Bolero y el Bolero (The Mother of the Shoeshine Boy and the Shoeshine Boy), a later print of a 1950s work by Manuel Álvarez Bravo (Lot 103, $1,200-1,800); Bernice Abbott’s classic Manhattan Bridge, 1936, printed later (Lot 94, $1,500-2,500); and Pioneer Mill, Cimarron, New Mexico, c. 1961, by Ansel Adams (Lot 107, $2,000-3,000). Come see what else is on offer at auction previews on May 11th from 12PM-5PM, May 12th from 12PM-8PM, and May 13th from 9AM-10AM. The Fine Prints & Photographs auction opens for bidding on May 13th at 12PM in our Boston Gallery. This entry was posted in Blog and tagged Ansel Adams, auction, Bernice Abbott, boston, fine art photography, Manuel Alvarez Bravo, Paul Caponigro, photograph, photographs, Photography, photography auction, skinner, skinner auctions, Walker Evans, Wright Morris by Michelle Lamunière. Bookmark the permalink.